AICM Government and Industry Affairs Manager (GIAC) core members meeting was successfully held in Henkel office on Mar 13th 2019. AICM Government and Industry Affairs Manager chair Richard Yu from Henkel reviewed 2018 achievements and 2019 plans. AICM board member DURAND-DELACRE Xavier and AICM Executive Director Beryl Ma welcomed all and led the discussion of AICM sustainable development report. Richard shared the details of mayor forum, chemical park forum and related communication with local government and chemical parks. 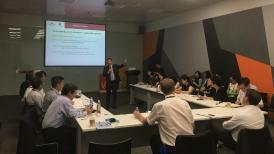 John Gao, AICM Government and Industry Affairs Manager organized discussion on 2019 government and industry affairs major events’ content and sent out the signal that foreign investment is once again welcomed in China. 15 member companies joined the meeting.